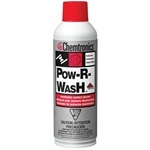 Pow-R-Wash™ Delta electronics contact cleaner is a highly effective solvent cleaner for electrical and electronic components and assemblies. Nonflammable, and compatible with most metals and plastics found in electronic assemblies, it is safe on energized equipment, fast drying and has excellent solvency for oil, grease, dirt. Contact cleaners restore electrical continuity to all electronic and electrical contacts by penetrating and removing insulating oil & grease, conductive carbon soil, and isolative oxides from contact surfaces. By restoring full circuit continuity, Chemtronics contact cleaners improve the performance of electronic equipment that relies on electrical contacts.